AAV–IL-27 treatment inhibits the growth and metastasis of tumors. (A) A single dose of AAV–IL-27 treatment resulted in sustained IL-27 production in mice. C57BL/6 mice were injected with AAV–IL-27 or AAV-ctrl viral vectors i.m. Mice were bled over time, and the concentrations of IL-27 in sera were detected by ELISA. Data represent mean ± SD of 3–5 samples in each group/per time point. 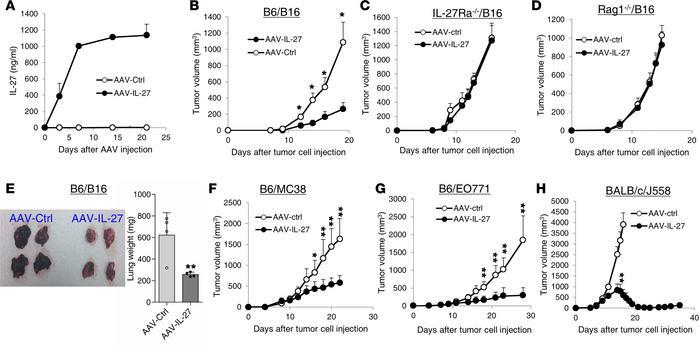 (B–D) AAV–IL-27 induced adaptive immunity to B16.F10 tumor. B16.F10 cells (2 × 105) were injected into C57BL/6 (B6/B16) (B), IL-27Rα–/– (C) and Rag1–/– mice (D) s.c. Four days later, mice were treated with AAV–IL-27 or AAV-ctrl viral vectors. Data represent mean ± SD of 5 tumors in each group. Data shown represent 2–3 experiments with similar results. (E) AAV–IL-27 treatment inhibits melanoma lung metastasis. B16.F10 cells (2 × 105) were injected into C57BL/6 mice i.v. Four days later, mice were treated with AAV–IL-27 or AAV-ctrl viral vectors i.m. Twenty-one days after tumor cell injection, mice were sacrificed and tumor metastasis in the lungs were shown. Data in the right panel represent mean ± SD of weights of the lungs from mice. Data shown represent 2 experiments with similar results. (F–H) Mice were injected with MC38 (F; 1 × 106 s.c.), EO771 (G; 1 × 106 intramammary), or J558 (H; 5 × 106 s.c.) cells, followed by treatment with AAV–IL-27 or AAV-ctrl viral vectors 4 days later. Data are expressed as mean ± SEM of 5 tumors in each group and represent 2 experiments with similar results. *P < 0.05, **P < 0.01 by Student’s t test.